Dry skin is caused by inactive oil glands that don't produce enough sebum for lubrication. It has a dull appearance and the skin feels dry and itchy. The skin feels tight especially after cleansing and is prone to flaking and red patches. It has a tendency toward fine lines and wrinkles. 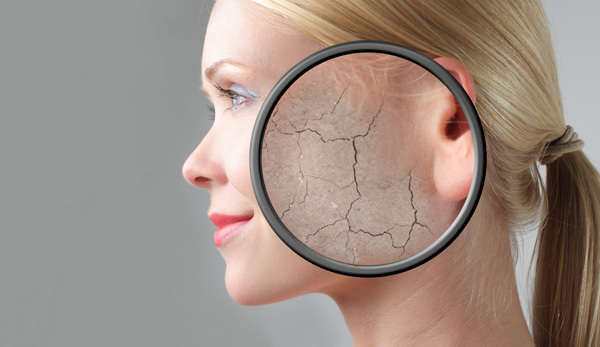 Dry skin may appear ashy or dull from dead skin build up. Dry skin needs to be hydrated regularly with fresh water mist as well as moisturized by rich hydrating creams or lotions. Calming and hydrating products with active yet gentle ingredients are the key to shedding the dry layers and revealing a bright, smooth complexion. Tip – Use Luke warm water and not hot water for cleansing. Use mild non soapy cleansers or creamy face wash as they preserve natural oils in the skin. Use cleansers containing glycerine. Rich hydrating moisturizers are required for dry skin. These will increase the skin's water content, improve its smoothness and decrease symptoms of itching, stinging and burning.